Did you guys enjoy the long weekend? 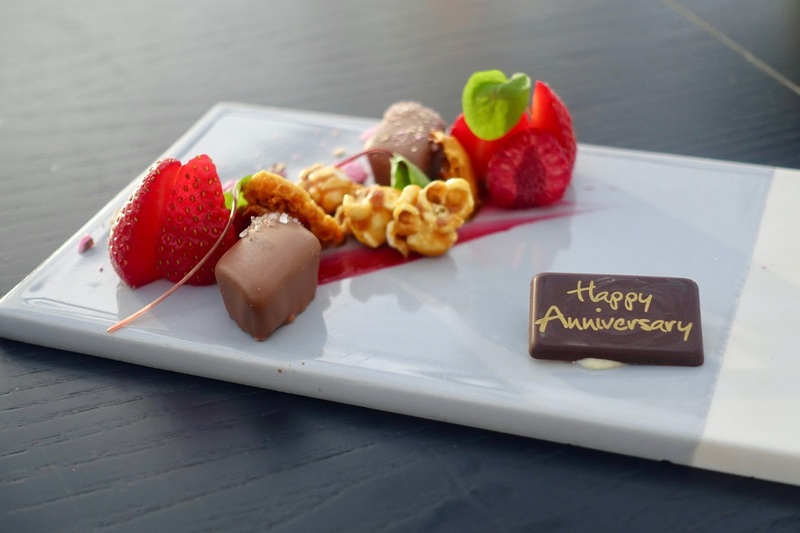 Today is mine and Hang's 2nd wedding anniversary, eeek how time flies right! Anyway we took advantage of the bank holiday and celebrated yesterday. (You can read about our wedding here.) So as I'm in the midst of busy wedding season and editing videos, it wasn't a good time to go away, you know I would be on a plane somewhere if I had the choice! 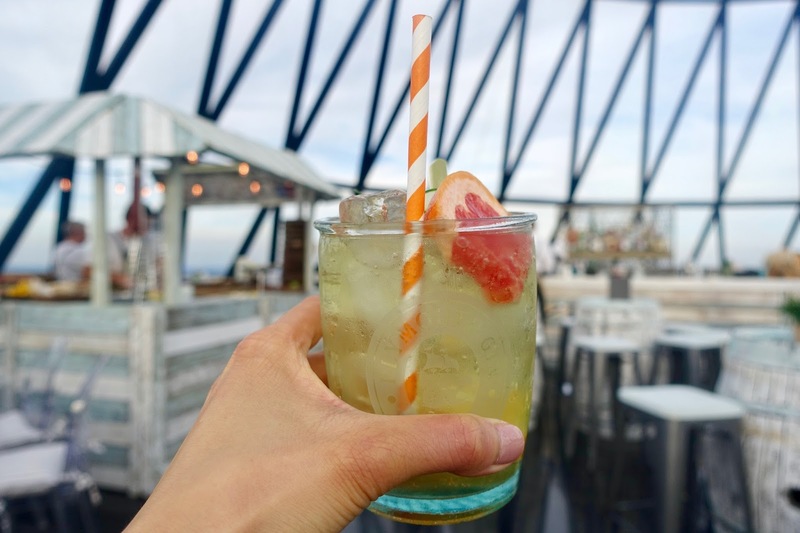 After scrolling through Insta, I saw some pics of the Searcys Beach Hut Bar pop up in The Gerkin building in London and it looked amazing. 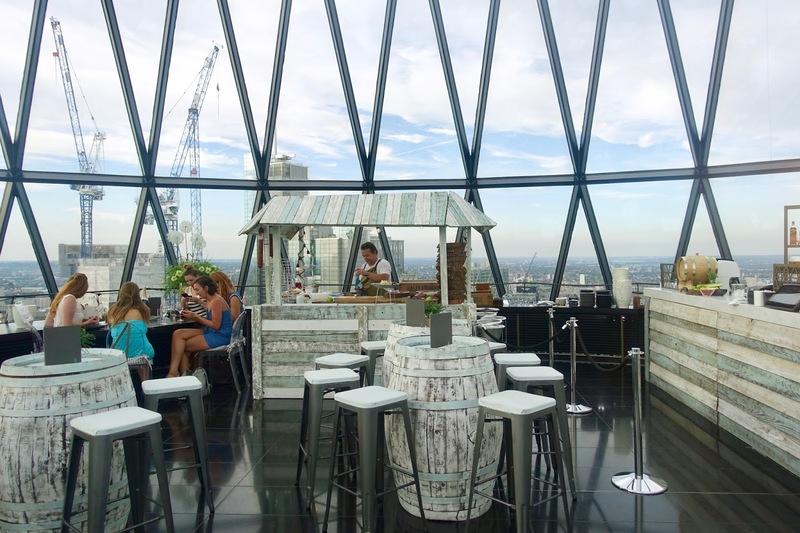 I loved the idea of the seaside theme and also we've never been to The Gerkin - who doesn't love a good skyline. 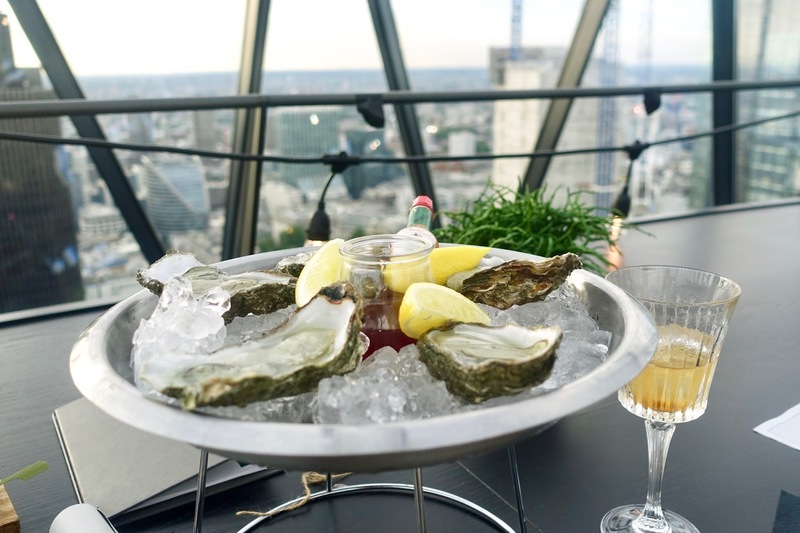 Searcys bar and restaurant is not usually open to the public so this pop up, which is only on for 6 weeks is great to enjoy some drinks and panoramic views in style. 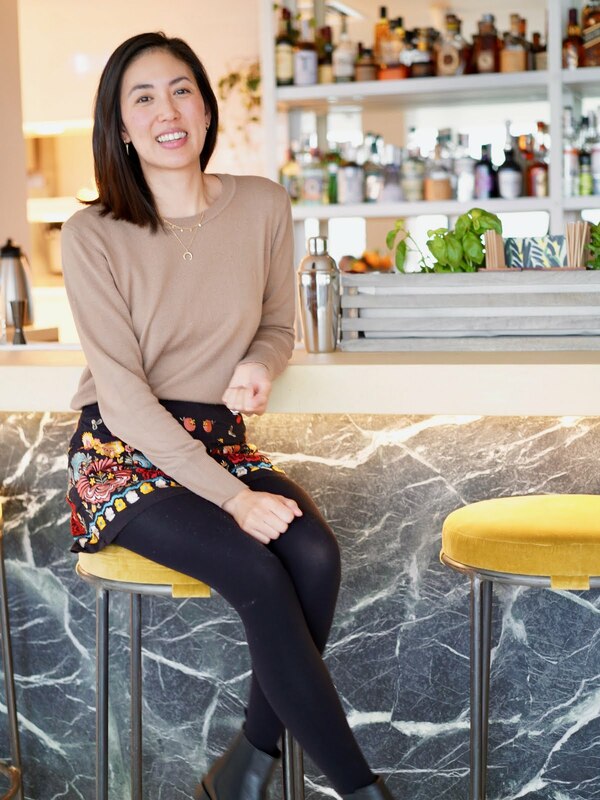 I made reservations online for the bar, as I wasn't sure how busy it would be or if you could just pop in from the streets. Anyway we arrived at the iconic building, passed through security and took the lift up to the 39th floor. When we arrived we were greeted by the friendly host and took a seat by the window. This bar is at the very top of the building, so you literally can not be any higher! The space even though was small, felt airy and spacious with all the glass. Isn't the seaside theme cute? 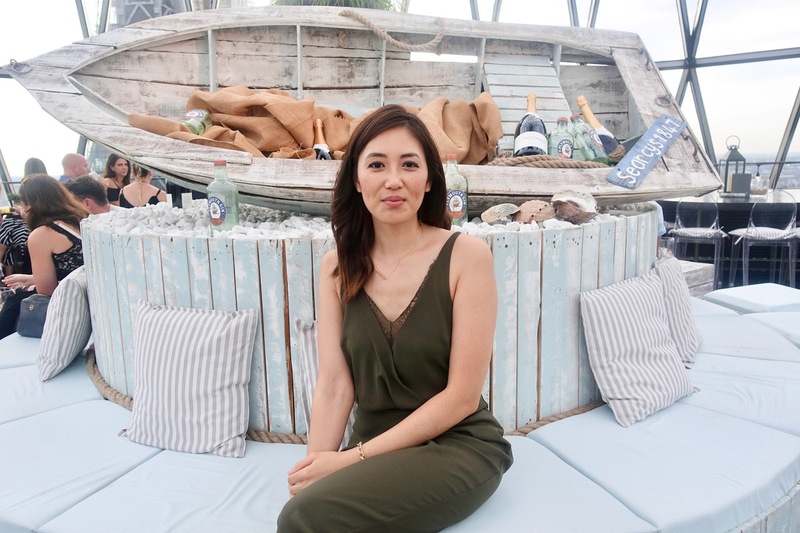 The baby blue seats, stripy cushion and beach hut style bar was the perfect setting to enjoy Searcy's summer drinks and food platters. 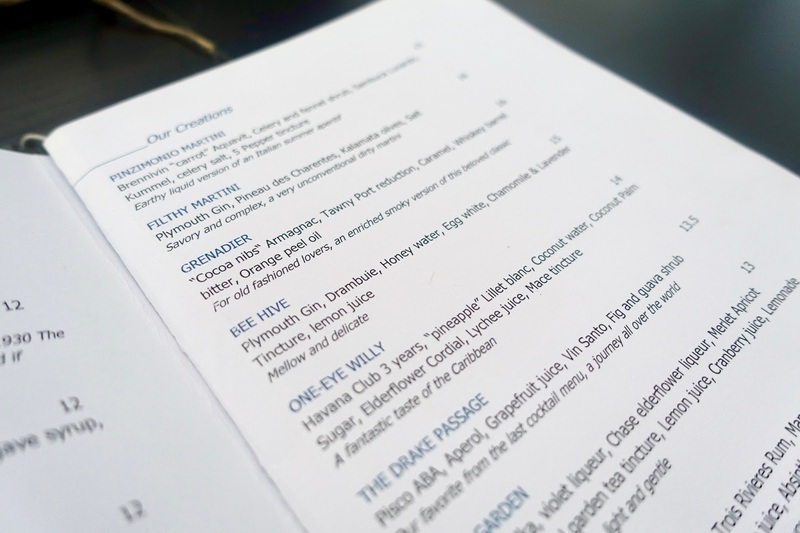 The drinks menu has a mix of wines, cocktails and bubbles. Hang likes gin so went for the Plymouth Gin cup, which had a blend cucumber, apple, mint, bergamot and lavender. I've never seen a lavender cocktail before, it smelt pretty good! They had some cool cocktails as well, I went for the 'One-eye willy' which had rum, coconut, elderflower and lychee. It was the perfect Summer cocktail - fresh and fruity! 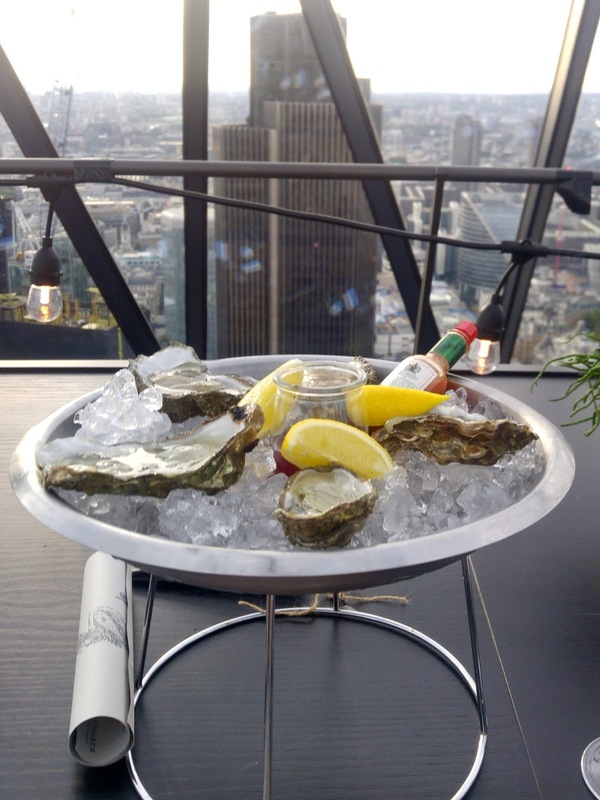 We weren't planning to get food as we had dinner reservations later on but we couldn't resist ordering some oysters, £11 for 6 oysters was reasonable too. We love cold seafood and always order a platter when we get the chance. It can be hit and miss with oysters but we were so glad these were really nice and tasty with the red wine sauce. We ordered 6 but they gave us 5 oysters, so we had to ask them for another one - Hang thought they put 2 in 1 shell! If you don't fancy seafood, you can also order cheese boards, pork pies, cured meats and breads. 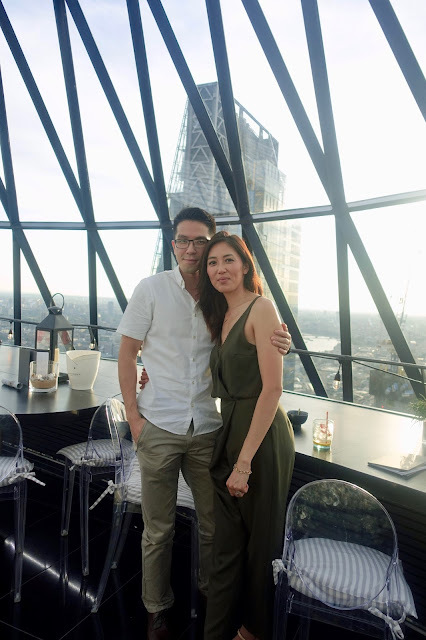 We had a lovely time at the Searcys pop up bar, it's a fun and sophisticated setting and nice to enjoy the views of London high up. The only thing is it ends this Friday! So you've got a few more days if you fancy popping along. 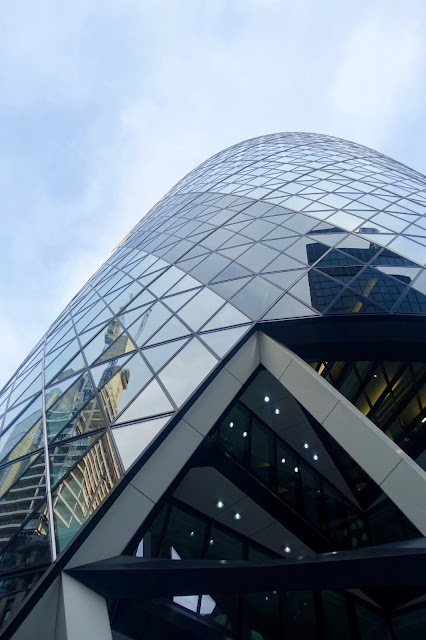 Have you been to The Gerkin? Also I got this jumpsuit from ASOS, I can't find the khaki one online anymore (similar here) but they have the black version on sale! It's so comfy and easy to wear, I like the tapered ankles and it has adjustable straps. What do think of the pop up bar? Let me know what you got up to this weekend! What's your favourite building in London?